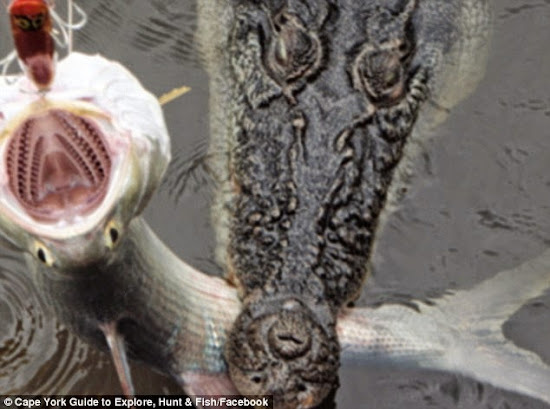 Australian angler Ben Stack reels in a threadfin fin during a fishing trip, only to find a crocodile hanging onto it. A fisherman has taken incredible pictures of the moment he accidentally pulled in a crocodile that was taking a bite out of a salmon he had hooked. Ben Stack, 40, has warned other Far North Queensland fishermen to be wary while out on the water after he came face-to-face with the salt water crocodile on a recent trip. Mr Stack was fishing in a small creek in Cape York when the Threadfin salmon he had just caught suddenly felt like a 'heavy dead weight'. Mr Stack thought the fish was stuck under a log, so he leaned over the side of the boat and started pulling in the line. 'I was hanging right over the side of the boat because I was trying to look in the dirty water to see what the fish was caught on,' he told Daily Mail Australia. Describing the close call in a post on his Cape York Guide to Explore, Hunt and Fish Facebook page, Mr Stack said what happened over the next few seconds 'felt like a lifetime'. 'First, I saw a bit of silver, then I saw my lure with the fish's mouth wide open,' he said. 'I lifted the leader some more and leaned over further to see what the fish was hooked up on. It was at this moment, I realised I was staring eye to eye with a solid salt water crocodile. 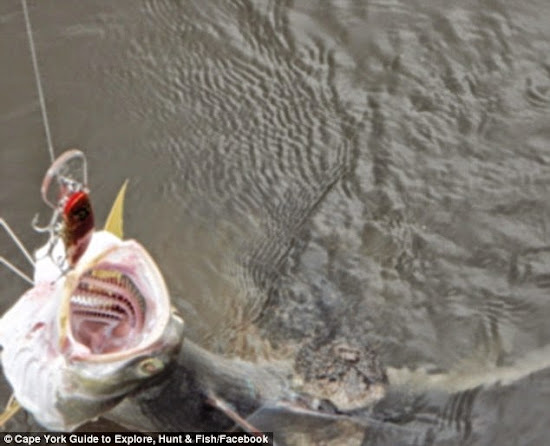 Mr Stack said he had his camera poised to take a photo of his catch, and he was grateful he was able to capture the incredible moment on film. 'I couldn't believe what I had just experienced and I didn't think anybody was going to believe me,' he said. 'Thankfully these pictures had turned out.